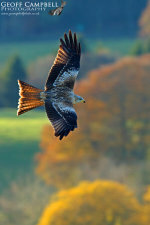 Despite the cloudy, wet and often windy start to 2013 it hasn't been too bad for my photography ambitions for the year. At the start of each year I normally set myself a list of species which I would like to get better or new photographs of, and each year I normally fail. This year though I have manage to get shots of two of the twenty or so target species. with a little effort I set a number of feeding stations in North Antrim and this year attracted a sizable flock of Lesser Redpoll a species which I was severly lacking in images off. When the light improved during January I finally started to get some good images (see latest images). 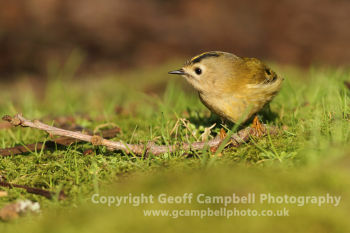 This week a lunch time walk in beautifully sunny conditions produced a rare opportunity to photograph our smallest native bird on the ground - a beautiful Goldcrest. As the bird fed on the insects in the mosses at the base of the trees I was able to snap away at close range. Normally these hyperactive little gems flit amongst the vegetation rarely stopping for a photo opportunity. This recent encounter was not without drama as my memory card failed during the shoot. Checking the camera some shots had saved but many had not, including those I thought likely to be the best. As soon as I got home I plugged the card into a rescue software package to see what happened. Thankfully some, though not all could be recovered, so certainly better than nothing. So species number 2 on the list achieved (just!). So if you know of any good sites for Woodcock, Otter or Kingfisher, especially in North Antrim, feel free email my privately and perhaps a few more target species can captured in 2013.